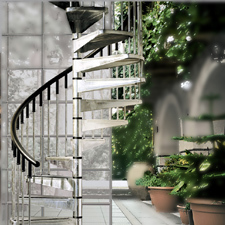 We realise that our customers also need an extensive range of products for everyday solutions to access problems, when space, budget and location do not justify the custom-made contemporary or classical staircase. Stairs & More supply Ehleva advanced modular stair systems with an extensive range of spiral and open staircases. These stylish staircases are designed for easy installation with all products kept in stock. The wide range of models and colours combined with flexibility offers cost effective solutions for the majority of requirements. Lofts, cellars or new extensions – we can provide ‘a solution’. 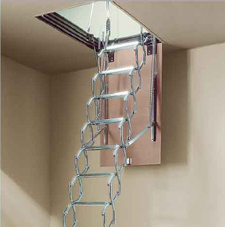 These can be spiral stairs, open modular stairs, space saver stairs, retractable ladders and fire escape stairs and ladders. Please contact us for a competitive quotation , with free help and advice on the best solution whatever your requirement. To get an idea of the huge range of possible layouts have a look at ehleva.com , ask for a brochure or email your well dimensions, floor to floor height and floor thickness and we will work out the best options for you.